The Plank Exercises has become a very popular ab exercise. There are many different ways you can do the plank to spice up your core workout. Below is an advanced ab workout using 3 different variations of the plank. Try this workout in circuit fashion, moving from one exercise to the next with little rest. When you get done with the third exercise, rest for 1-2 minutes and then repeat the circuit 1-2 more times. You can click on the picture to read more about the exercise. Ab and Core Exercise #1: 1 leg Plank- The 1 leg plank will challenge your abdominals and core muscles much more than the regular plank. The leg that is on the floor will have to support your entire bodyweight, and your abs and lower back will have to stabilize your spine and stop it from tilting or twisting. Focus on keeping the spine solid and stable. Tip: don't raise your leg up as high as possible. Make sure your lower back stays in good alignment. Hold for 10-30 seconds on each leg and then go to the next exercise. Ab and Core Exercise #2: Moving Side Planks- The moving side plank challenges your obliques and your shoulder stability. You can actually do this exercise from your elbow or from your hand. You will get a little more range of motion if you do it from your hand and you should feel a greater stretch when you balance on your hand compared with your elbow. Perform 10-15 reps on each side and then move on to the third exercise. 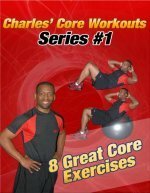 Ab and Core Exercise #3: Ball Plank- The stability ball plank is also a challenging exercise. Because the ball is unstable your shoulder stabilizers and core muscles have to work overtime to keep you in the correct position. Hold for 10-60 seconds and then rest for 1-2 minutes before going through the circuit again. If you are a beginner, aim for less time and fewer repetitions at first and build up your strength. Try to get through the circuit 1-3 total times. If you find these exercises are too challenging, try substituting basic versions of the plank or add in any of your favorite ab exercises from this site. Always listen to your body and have fun working out.